In years past, websites that coveted the top spot on Google’s search results list had an easy way to get there—take your content, stuff a ton of relevant keywords in and then hit “publish.” Suddenly, these websites received all kinds of traffic…but conversion never followed. Why? Because the content simply did not connect with the reader. We know the struggle is real here. You want your website to perform well. You want to be found by your audience and you want those conversions. But you also want content that communicates your passion for what you do. 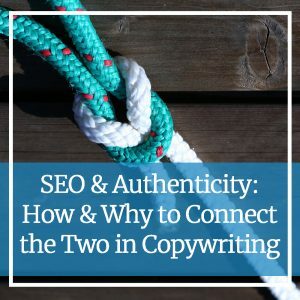 Is there a way to have both SEO and authenticity in your content? You better believe there is. If one thing is certain, it’s this: SEO is hard. Optimizing your website to reach your audience takes time and a lot of effort—neither of which many small business owners don’t have. But, without a simple understanding of SEO, creating content becomes a burden you’ll continue to push off. SEO is can be creative, but it is also technical. When it comes to creating content for your website, you must know that storytelling and technical SEO go hand-in-hand. This means you will never have the best SEO strategy if you forget to tell a story. And, yes, the same is true if you flip those two around. And so much more. Technical SEO is critical for your website and cannot be ignored. Even the best content will need technical SEO to be found. Listen, we get it. It’s hard to navigate the technical side of SEO and the authenticity side, too. But they’re both critical for creating successful content that converts. Only 18% of consumers say they trust business leaders to be truthful. And a whopping 84% of millennials say they don’t like advertising at all. Why? Because for so long, instead of being authentic, we’ve been acting as salesmen in our content. We’ve been focused on selling features instead of sharing benefits and showing transformations. The most important benefit of all for your audience is this: your service will fill their need. And your story will bring this message home best. It will help connect you to your ideal clients, urging them to reach out. The best SEO strategy combines this authentic connection with technical optimization in one complete package. There are a few simple tips you can start working on today that will help you tell your story and remain SEO-conscience. For technical SEO, consider hiring a professional that understands the ins and outs. Doing anything on your website without understanding your SEO could actually damage your rating. For your content, consider the time you have to dedicate. If you don’t have the time to pen authentic and high-quality content, reach out for help. Stop trying to sell your service’s features to your audience. Instead, tell them a story about how your service will change their life or fill their need. Your website and content are out there for your reader, not for you. Focus on the customer experience first and foremost. Everyone deserves honesty. Be open and honest to truly connect with your audience. Put the “you” back into your content. Use your personality to speak about your business, instead of trying to sell your service. Authenticity goes a long way. Confused About All This? We’re Here to Help! SEO copywriting doesn’t have to be scary. Our team here at Custom Content Solutions understands the importance of SEO and your story. We believe they should work together. To get experienced, dedicated help, reach out to us today by calling 612-643-1824 or send us a quick message online.